I looked at the digital numbers displayed on my cell phone. I recognized her name. She was a woman I had met while researching an article about the visit of the Grand Mufti of Jerusalem to Auschwitz. Her voice instantly transported me to the Holocaust world of my parents, a world that I resisted and to which I was drawn. I would read voraciously, engage with the dwindling number of survivors and their children but I drew a line. I would never ask about what they had seen or heard or thought. 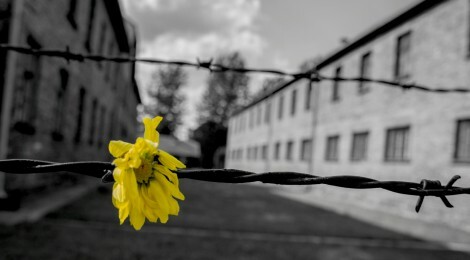 Unlike some descendants and even survivors, I decided that I would never visit Auschwitz. I knew that the moment that I saw the narrow, rust colored bricks, I would become unwound and that the ghosts of the tortured, gassed and burned souls would fill my consciousness. The image of my maternal grandparents, Samuel and Esther Husz, the sight of the electrified fence, its concrete posts weirdly curved inward like bent index fingers, so feared by my mother, would have stilled me. She said that her Italian furniture had given her cancer. I tried to follow her, assess what she was saying. Were her words the result of drugs, mental decline? But I knew Raiza to be highly intelligent, forceful, honest. I had met her six months earlier when I had visited her Boca Raton condominium to interview her. I downloaded photos of the Grand Mufti, printed them and went to see her. I found a small, elegantly dressed woman. Her apartment had tile floors and plastic covered furniture. A Haitian aide bustled in the kitchen. She had had many health problems but seemed to have overcome them all. She had one, child, a son. A doctor. She had been married twice. She had met her first husband after she was liberated from Bergen Belsen and had married him the same day. “The same day?” I asked, wide-eyed. He had died in a car accident in Belgium, she told me. She had re-married in America. But our visit was about our families. To my astonishment and perhaps hers, she was from the same town as my maternal grandmother. Her father was from my mother’s town, Ruscova, Romania. She had been deported to Auschwitz at the same time as my mother. She had been a slave laborer as had been my mother. She recognized every name. She pronounced Genuth, Ghneth. I was incredulous that I should have been directed to her at a time when my own mother could no longer talk and I continued to mourn the recent death of my father. Her Romanian Yiddish accent was comforting, familiar. I thought of my mother’s sisters, Frida, Charna and Dvora, how wonderful they had been to me, shielding me from the horrors of what they had witnessed, loving me, delighting in me, encouraging me, offering me whatever they had, food, praise, presents. Keep speaking, Raiza, I thought. I showed her the photos of the Mufti. She said that the man she saw had had a beautiful uniform. The Mufti was always depicted as wearing a tall, white turban and sweeping caftan. She could easily have said that the man in the photograph was the Mufti and I could have gone on to write the article, but she didn’t. She was a fierce guardian of her memories, even if they didn’t fit the narrative. I didn’t write the article. She would call me from time to time. She would wish me a Happy New Year, a Happy Chanukah, though I privately believed that she no longer a practicing Jew, a proud Jew, yes, but a Jew who no longer proselytized, tried to convince anyone. She had seen too much. Then, I received the call. Before I hung up, I promised to come see her. She mumbled the name of the nursing facility. A day or so later, I looked it up. One entry resembled the name she had given me. The telephone number she had used and the listed number were the same. The weather was exceptionally beautiful. “I am going to Boca Raton,” I told my teenage daughter. I had left the directions at home but somehow, I found my way. I pulled into the parking lot of the one story nursing home surrounded by mature trees that dropped their brown leaves on the lawns and walkways, where they remained, uncollected. I hated all nursing homes. My father hated the nursing home into which he had moved shortly before his death. But I knew I had to compose myself. I parked at the rear of the facility. They spoke loudly and rapidly in Caribbean cadence as they spoke on cell phones and to each other. One woman pointed, head bowed. I walked past wheeled racks of food trays. The sliding glass door opened. So much for security, I thought. I wondered why I had come. I knew that Raiza was an insightful, far-seeing, exceptional woman. When I had earlier visited her in her apartment, I unexpectedly found myself speaking of my own heartache, of the divisions in my family. We sat at her dining room table, moving from English to Yiddish and back again. I felt that the act of telling her things I had told no one, could no longer tell my father or my mother, had been a resolution. I went to the reception desk and asked for Raiza’s room number. The attendant pointed to her right and returned her attention to her computer monitor. And there she was, sitting in a hospital bed, very thin but well groomed, eating lunch. “Here I am,” I said. She acted as if she knew that I would come. I sat on her bed, facing the window. So, we started to talk. She said that she had witnessed 530 English soldiers gassed in Auschwitz. She said that hundreds of girls had been forced to march in the snow and that only 20 something had survived. Only she didn’t say 20 something. She said the exact number. She spoke so much that my mind could not absorb what she said. She said that she had been the victim of medical experiments, that all her blood had been drained. I showed her a cell phone photo of my maternal grandmother and my paternal great-grandmother, taken in Ruscova in 1943, at a time when my mother said they were “already auf tsouris”. “That is exactly how my mother looked, she said, “with the tichel”. “I know we are related somehow,” I told her. She spoke about her first husband, a Polish Jew, said “he looked like Robert Taylor”, about how they had waited for years to be able to immigrate to America, how they had moved to Belgium, how she had discovered that he was having affairs with other women and how she had left him, taking their 13 year old son. Her words reminded me of my now distant memories of my own marriage. She had forgiven him, it seemed, looked at him fondly. “They didn’t have seat belts in those days,” I added incongruously. An aide entered the room. Raiza spoke to her in French. “I don’t speak French,” the woman said. “I speak French, Flemish, Spanish, Yiddish, Hungarian, Romanian and Polish,” Raiza said, as she left. What happens to all this when she is gone? I thought. I stood and pulled down her soft sky colored tee shirt that had risen, exposing her ribs. I pointed to the flat screen television hanging on the wall. “Do you watch?” I asked. Her gray hair was beautiful. “My mother was 19,” I said. I couldn’t imagine how she had survived. She had seen everything, lived among the dying. What had sustained her? I did not ask. The words tumbled out of both of us, a desire to share her experiences, my recollection of my mother’s history. I talked and talked. I became my mother as I sat on Raiza’s bed facing the dark trees and the sunlight and the running stream outside her window. “I am not here as a lawyer,” I said, “we are friends”. I gave him my name and phone number. I heard his sad voice, felt his fear and love for his mother, their unique bond. She had told me that he had been in Boca Raton with his wife and children for four days and then gone back to Connecticut. He wasn’t a medical doctor. He was a single child of a single mother, a Holocaust survivor, an extraordinary woman. “We’re probably related,” I said. Children of survivors delight at that expression. I told him to call me if he needed anything. I handed the phone back to Raiza. She joyfully spoke with her son.